Something is wrong at the heart of Uttlesford District Council as it struggles to complete two major exercises that are important not only for this district. The first is a critically important Local Plan for the future of the district. If UDC does not publish an updated plan in June, local control over planning may be lost to faceless bureaucrats sent in by the Westminster government. That would have enormous consequences by way of another planning free-for-all for developers in all our towns and villages. The second challenge is a planning application (reference UTT/18/0460/FUL) from Stansted Airport Limited that would make the one runway capable of handling around 50 million passengers a year (mppa); double the present throughput. The impact on Great Dunmow, Saffron Walden, Stansted Mountfitchet, Thaxted and surrounding villages within Uttlesford district, but also Bishop's Stortford and Sawbridgeworth, will be significant. The rest of Essex and counties beyond will also feel the impact from road and rail traffic congestion, daytime and night-time noise, air pollution and climate changing carbon emissions that cannot be treated lightly. So, you may ask, what's different from the last time, 12 years ago, when Stansted Airport wanted to lift its capacity from 25mppa to 35mppa? Please allow me to tell you. The previous application was submitted to UDC on 26th April 2006. Within one month a meeting in public of the then planning committee met to begin scrutinising the proposals. This allowed the public and councillors to get involved in what the airport wanted to do and what it meant for local people. The current application arrived at the district council on Thursday 22ndFebruary 2018. Over two months later in early May there has not been a single meeting in public. None is planned until July. In 2006 there were 16 meetings in public at which councillors and members of the public challenged and investigated the implications of a 65% increase in passenger - a surge that has still to become reality. This year there may be as few as two meetings only in public before a doubling of airport passengers capability is either approved or refused. In 2006 the district had a Liberal Democrat-controlled council. In 2018 it has a Conservative-controlled council. 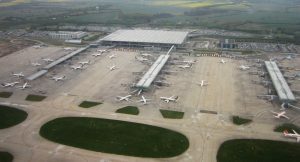 You may now be aware that the extra aircraft taxiways and stands at Stansted would make the airport capable of growing to the size of Gatwick at around 50 million passengers; not the 43mppa on the label of the application documents. So, for the past three weeks I have been seeking a meeting with planning officers to discuss my concerns about the seemingly fast-track, low profile way in which this high impact scheme is being progressed. I can report obfuscation and avoidance. Despite this lack of transparency and democratic accountability at UDC, time has been found to hold 35 meetings with airport management behind closed doors. These private meetings have been attended by senior council personnel. The time to shine a light on the proposals and the planning process is long overdue. I urge local people in Essex, in Hertfordshire and beyond to raise their voices to tell Uttlesford District Council, its Leader, Cllr Howard Rolfe, and its planning department that they need to get real about this very material desire of Stansted Airport to transform its "airport in the countryside" beyond recognition. Note: Representations can still be sent in to Uttlesford District Council, even though the formal deadline has passed. Use this link - PLANNING APPLICATION , insert the reference UTT/18/0460/FUL and go to "Make a Comment".